Why should CRM pricing be a mystery? Unfortunately, for whatever reason, it’s really hard to find CRM (Customer Relationship Management) pricing on the Internet. Providers usually want to get a salesperson into your office for a consultation before they give you an idea or the cost of their product. But that doesn’t make sense. Why should you waste your time investigation solutions that are not within your budget range? There is a better way. 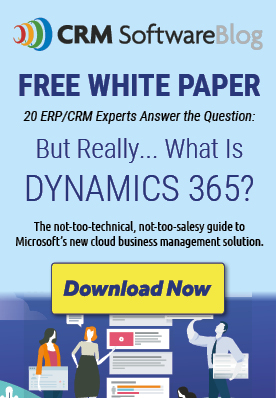 The answer is the Microsoft Dynamics 365/CRM Quick Quote tool that’s available right here on the CRM Software Blog. Why do we provide a quoting tool? Because, contrary to the mainstream view that it’s not a good idea to make pricing readily available, we have nothing to hide. We believe that Microsoft Dynamics 365/CRM pricing should be accessible to anyone who is evaluating CRM systems for their company. Why not give it a try? Look for the orange button labeled “Request Instant Quote Dynamics 365/CRM.” It appears at the top right of each page of the CRM Software Blog. Clicking that button takes you to our Microsoft Dynamics 365 Quick Quote Request Form. And from there you are only moments away from a free, fully automated budgetary estimate for the full cost of Dynamics 365 software, implementation, and training. On the Quick Quote form, you’ll indicate whether you’re interested in 365 Business Edition or Enterprise Edition. Then, provide your contact information so we can email you an instant quote. We’ve made it easy because we know that’s what you want. After all, the Internet was designed to provide useful information for people like you who are trying to make their best decisions. Get a Microsoft Dynamics 365/CRM Quick Quote today and see how this powerful solution will fit into your budget.